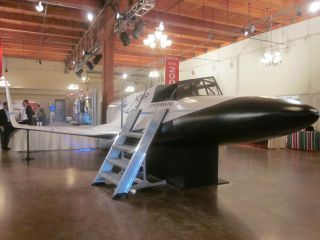 A full-scale model of the XCOR Lynx spacecraft under development was on display at the 2012 International Symposium for Personal and Commercial Spaceflight in Las Cruces, N.M. The builders of a new private space plane designed to launch a pilot and passenger on suborbital spaceflights offered a glimpse inside the novel rocket ship last week during an annual gathering of commercial spaceflight companies and experts. A full-scale mockup of a new suborbital spacecraft, called the Lynx, was on display by the Mojave, Calif.-based commercial spaceflight firm XCOR Aerospace during the International Symposium for Personal and Commercial Spaceflight in New Mexico. The vehicle is designed to carry one pilot and one passenger on brief rides to space for $95,000 a ticket. The Lynx mockup was on hand for conference attendees, including this reporter, to climb inside for a taste of what its future passengers are in for. SPACE.com reporter Clara Moskowitz sits inside a mockup of the XCOR Lynx suborbital spaceship. The cockpit is roomy, with a full array of switches, knobs and controls taking up most of its surface area. Its real appeal, though, is the curve-around bay of windows in front and overhead both the pilot and passenger's seats. These panels should provide an amazing view of the blackness of space and the curved Earth below for those riding inside. "I am very pleased to say we are progressing in building the Lynx and flying it within the next year," Andrew Nelson, chief operating officer of XCOR Aerospace, said at the conference Thursday (Sept. 18) in Las Cruces, N.M. "We're hitting on all eight cylinders. We're really excited." The Lynx is slated to begin flying passengers out of California and a launch site in the tiny Caribbean island of Curaçao by 2014. The vehicle is intended to fly at least 62 miles (100 kilometers) high, but won't make a full orbit around the Earth before returning to the ground. Such a voyage should offer passengers a few minutes of weightlessness and a view of space, without the high cost and difficulty of orbital space travel. Lynx can take off and land on a conventional airport runway, and could make up to four flights a day. The view inside the cockpit of a model Lynx suborbital space plane from XCOR Aerospace. XCOR recently partnered with the Netherlands-based space tourism firm Space Expedition Corporation (SXC, formerly Space Expedition Curacao), which will broker sales of future Lynx flights out of both Mojave and Curaçao. "We are providing easy access and reliable access to space on a daily basis," SXC's Ben Droste said. "We consider ourselves a spaceline." The view from flights leaving from Curaçao will be particularly spectacular, he added. "Nothing beats flying over the Caribbean, from 100 km, looking down. It is wonderful."